A backpack’s a great way to carry a bunch of stuff while keeping your arms free. That’s why they can be a great photography accessory. The fact that it’s always out of reach on your back is annoying, though. This is surely why Wolffepack has created a photography-focused pack you can access without having to remove it. Hidden in the Wolffepack Capture’s right shoulder strap is a release cable that separates the bag from its straps. It then lowers the storage compartment, so you can pull it around in front of you to grab what you need. When you’re done, pulling on the strap again hoists the bag back onto your back with its weight evenly distributed across your shoulders. A latching mechanism prevents accidental releases, but it looks like the mechanism is easily to unhook singlehandedly. This isn’t the company’s first backpack to use this wacky swinging trick, you can see an older version demonstrated in the video above. But it is Wolffepack’s first bag tailored for photographers, featuring a removable padded compartment inside to protect a camera and lenses, room for a 15-inch laptop, a waterproof rain cover, and an external pocket for carrying a tripod. Unhooking and swinging your backpack around like a wrecking ball tethered to your shoulders might not be for everyone, but for those who don’t want to disturb the shoulder straps they’ve finally got perfectly comfortable, the Capture is available for pre-order via Kickstarter for about $150, including all its camera-carrying accessories. 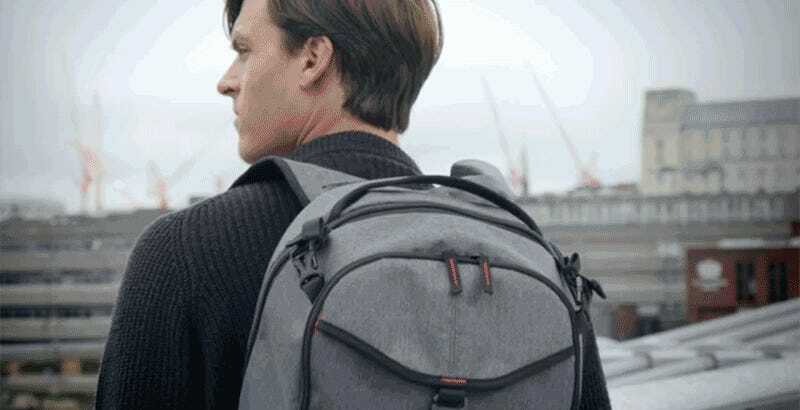 The usual crowdfunding risks certainly apply here, but since this isn’t Wolffepack’s first backpack, the company is already aware of possible problems and delays that might pop up as it moves into production. So there’s reason to believe this pack might actually be available closer to November.